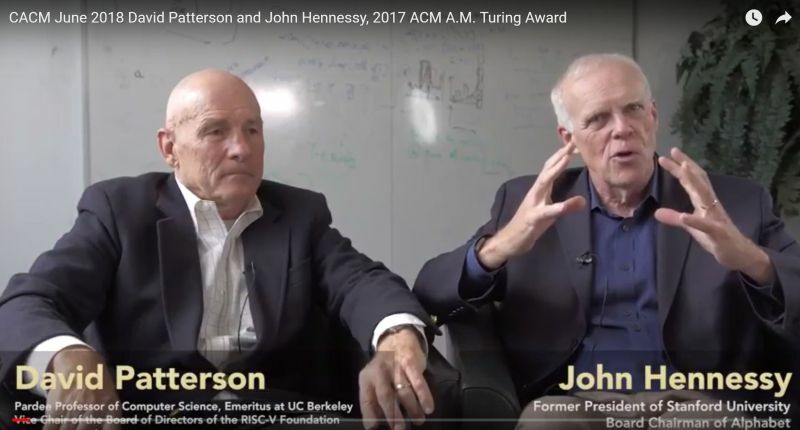 Earlier this year, Berkeley’s Dave Patterson and Stanford’s John Hennessy won the 2017 Turing Award, the premier award in Computing. Hennessy and Patterson are best known for their early research in Reduced Instruction Set Computing (RISC) but I first came across their work back in 1984 when Jennifer gave me their seminal computer architecture book Computer Architecture: A Quantative Approach as a birthday present. If you work in Computer Engineering, Electrical Engineering, or Computer Science with an interest in lower level systems work and don’t already have a copy of the book, you really need one. More than 20 years after getting my first copy, enough had changed that I bought the newest edition and it’s since been updated at least once more. It’s interesting that each of these have a Turing award winner as one of the coauthors. The first two books remain highly relevant today. The latter, Architecture of a Database System, was super useful for me in that it got me closer to caught up in the current database state of the art when I started working on database managements systems many years back. And, even today, it remains one of the few places where you can get many of the details and core principles and approaches taken by the major commercial database management systems prior to the emergence of open source databases. I even got to contribute a bit to the most recent edition of Architecture of a Database System. 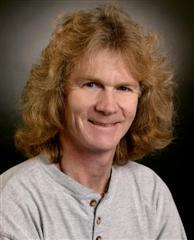 There is no question that the RISC effort at Berkeley and Stanford continues to have massive influence on computer architecture and modern processors but, even beyond this, Patterson and his students have done a vast amount of industry leading work over the years. Many of these projects have had a big influence over my thinking. One of my favorites was A Case for Redundant Array of Inexpensive Disks (RAID). Patterson, Garth Gibson, and Randy Katz did the RAID project. If I had to point to the one academic project that has most influenced my designs, this might be the one. The core idea of replacing an incredibly expensive “enterprise quality” components with a set of redundant and less expensive components just keeps playing out in our industry. Anywhere we find a gold-plated hardware platform, there is opportunity to replace this system with a redundant array of high-volume, inexpensive parts. Exploiting volume economics and redundancy to produce less expensive solutions with even better reliability, availability, and serviceability is a theme that has kept me busy for much of my life and the idea is nowhere close to worn out. Patterson is unusually forward thinking, highly in tune with real industry problems, and doesn’t get lost in the weeds. I’m usually fairly busy so it’s super hard to be able to afford to read even just the best papers much less all that is published in our field. Over the years I’ve been lucky enough to often get excellent papers recommended to me by those that really do have the discipline to plow through vast numbers of published papers. I mostly stick to reading the recommendations, but Patterson has always been an exception for me—if he writes a paper, I’ll read it. If he does a talk, I’ll watch it. So, when the 2017 Turing Award Lecture became available a couple of weeks back, I dove in. Taking the great Dave Patterson’s lead: don’t you think you’re due five or more PoA talks, by now? You should consider, at the end of the year, writing about the papers you’ve found ground-breaking, if you’re not doing that already. Thanks. I’m full of gratitude that you keep this blog alive. You’re 100% right, I should do a PoA talk — if you check the archives, you will find one or two that I have done in the past but it has been a while since the last one. I heard a statement that Amazon, and probably AWS, uses NoSql almost everywhere. Is it true? In other words, is it true that Amazon prefer NoSql solutions over RDBS ? We used to use RDBMS just about everywhere but NoSQL solutions scale better and are more reliable at high operational loads so they are our most common choice for high value operational systems. We are very big users of DynamoDB. Relational systems have more functionality and support richer query so they remain a great choice for data warehousing and analytic workloads and we use them extensively. We use vast numbers of Redshift clusters and AuroraDB. Generally, we’ve learned that using the same database everywhere is a bad idea and we aim to use the right database system for the workload. Great write-up James. Brought back many memories. I was introduced to David Patterson’s work twice in my career (actually it touched pretty much everything I did but there were two prime examples), once as a young engineer developing fault-tolerant microprocessor control systems for power plant turbines and later US Navy destroyers and then later in my career with RAID storage controllers at Adaptec. It was there I met a brilliant Chief Technology Officer, Tom Treadway who was with DPT in Orlando, FL when Adaptec purchased them. Tom became CTO with Adaptec and he gave me Patterson’s paper when I started there as site leader with the comment – “just read this, it’s all you will need”. Of course, I needed more and Tom provided it. I bring up Tom because he also affected me in another way. Cruising! Tom kept his 45 Sedan Bridge in Indian Rocks Beach about 2 hours from the Orlando office. He would roll in on Fridays in shorts and flipflops and as he walked by my office would yell in “It’s Boat Friday”! He was on the road by one, his wife driving the family while he worked the phones. We boated with them many times in the St Pete area and the keys. He and I spent many a day and night on the road, often to IBM’s Research Triangle operation when we took over their serveRAID business and then up to Rochester, MN for their RAID business. He was highly respected by the IBM technical and management team. Regretfully, Tom passed away 5 years ago after a 4 year battle with a rare skin cancer. On his last visit to our St Pete home, I was able to get him to the of our dock at night. He was not all that coherent by then. Incredibly though, a dolphin broke the water nearby and blew air. In a moment of clarity, Tom said: “Wouldn’t it be neat to be a dolphin?”. He passed a couple weeks later. We are now cruising up the US East Coast in our 55′ Novatec Motor Yacht. One of the prime reasons for purchasing her was Tom’s life. He proved to us life is short and we would be kicking ourselves if we did not expand our cruise reach. As you know, dolphins love our wake. They always bring a smile to my face as I think maybe Tom is leading that pod. Thanks for the great memories and continued safe cruising. Thanks for the comment and the story about Tom Treadway. Glad you are boating and enjoying yourselves. it’s far too easy to do a good job at work, earn a respectable lifestyle, but never really have time to enjoy it.